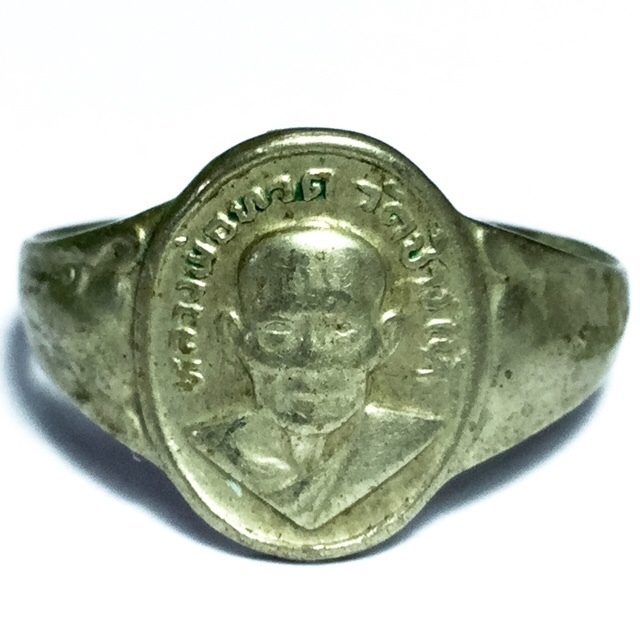 Hwaen Luang Por Tuad Kreung Ongk 2506 BE - Half Torso Cameo Ring of the Legendary Guru Monk Luang Phu Tuad (Wat Chang Hai). Blessed by the Great Ajarn Tim Tammataro, abbot of Wat Chang Hai. Released in the Year 2506 BE BE. The rings were made in Pim Lek Hua Glom round shaped ring, and in Pim Roop Lo, shield shaped ring. They were also made with and without Yant inscriptions of Khom Agkhara on the inner face, resulting in varied levels of appreciation and price level, as their rarity increased. But the edition still enjoys a highly affordable market price compared to most other amulets of the Pantheon of Luang Por Tuad Wat Chang Hai Temple. The amulets of Luang Por Tim of Wat Chang Hai are immensely favoured and highly regarded in the Pra Niyom amulet appreciation societies, and for their sacred power. The amulets of Luang Por Tuad are known for their power to protect the Devotee from 'Dtaay Hoeng', which means, to die in disastrous pr unforeseen circumstances. The 2506 BE First Edition Ring is one of the great Niyom Class popular Luang Por Tuad amulets of Wat Chang Hai, but which is found at a much lower price than many amulets of this Era from Wat Chang Hai, which were blessed by the Great Ajarn Tim, who was the creator of the first original Luang Por Tuad Amulets, and the Master of the Wicha. Luang Phu Tuad is known by all Thai people in every Province. Sometimes he is known as “Luang Phor Thuat” and sometimes “Luang Pu Thuat. “Pu”, meaning “grandfather” and “Por” meaning “Father”. It depends on the age of a monk whether he is called Luang Phu, Dtaa, Por, or Pi. He is possibly most famous with the common folk for his legendary powers and for the miracle of turning seawater into drinking water. This is in fact his nickname; “Pu Thuat Yiab Nam Tale Jerd” (Pu Thuat stepping over the seawater and turning it to fresh water). He was born about four hundred years ago, towards the end of the Reign of King Maha Tamaracha of Krung Sri Ayuttaya, in Suan Jantr village in the municipality of Chumpola. As a child, although having been born into an extremely poor family, he still was renowned for his compassionate and generous attitude. He liked to make merit (called “tam bun” in Thai) both in the Buddhist temples and in everyday life with his kindness to others. He never hurt other living beings, be they human or animal.
. Luang Phu Tuad was already displaying his miraculous powers from a young age, when one day, his mother went out in the garden and saw that an extremely large snake had wound itself around the hammock where her child, the young baby Luang Phu Tuad was sleeping. he snake would not permit anyone to approach near to the hammock and the child. After watching for some time, the parents decided that this giant snake was an angelic Deity come to show the special merit of their child. So they went and got some puffed rice, flowers and incense and rushed back to offer it to the snake, in reverence. When they made the offerings to the great snake, it wound itself out of it’s embrace with the hammock that baby Poo was sleeping in, and left. The relatives all rushed straight over to the hammock crib with great concern for the baby’s safety. But to their surprise, the baby was not only sleeping safe and soundly, but, on his chest, was a multicolored crystal, glowing with strange radiance. His parents kept it, and since then, the family managed to survive a lot more easily, and were successful in their business activities. At the age of seven, the young Luang Por Tuad was taken to Wat Gudti Luang, in order to learn to read and write, and obtain some schooling. But the young boy was exceptionally diligent, and was quickly able to read and write Khom script (Pali text using ancient Khmer script). At the age of 15, he was ordained as a Samanera (novice monk), and his mother gave him the Mystic Crystal to keep with him always. After this, the young Samanera (Naern Pu) was sent to learn with Somdej Pra Chinsaen at Wat See Hyong , where he stayed until his ordination as a full Bhikkhu, – he then continued his studies in Nakorn Sri Tammarat at Samnak Pra Mahatera Biya Tassee . His Ordained name was Ramoe Tammigoe, but common folk preferred to call him “Jao Sameeram”, or “Jao Sameeramoe”. So Jao Sameeram (Luang Por Tuad) to study on at Wat Ta Pae, Wat Sima Mueang, and many many others too. After completing hs studies in Nakorn Sri Tammarat, he asked for permission to go by Sampao boat to Ayuttaya. As the boat was passing the Chumporn district of coastline, a hefty storm arose, waves bashing against the hull, wind screaming through the sails, and they were forced to drop anchor and remain where they were for a period of 7 days. The seamen became superstitious, and started making suppositions that “Jao Sameeram” was the reason for this terrible storm, and decided to ask the young monk to leave the boat and go to the nearby island on the rescue boat. His Ordained name was Ramoe Tammigoe, but common folk preferred to call him “Jao Sameeram”, or “Jao Sameeramoe”. So Jao Sameeram (Luang Por Tuad) went to study on at Wat Ta Pae, Wat Sima Mueang, and many many others too. After completing hs studies in Nakorn Sri Tammarat, he asked for permission to go by Sampao boat to Ayuttaya. As the boat was passing the Chumporn district of coastline, a hefty storm arose, waves bashing against the hull, wind screaming through the sails, and they were forced to drop anchor and remain where they were for a period of 7 days. The seamen became superstitious, and started making suppositions that “Jao Sameeram” was the reason for this terrible storm, and decided to ask the young monk to leave the boat and go to the nearby island on the rescue boat. There are many more miraculous stories of the legends of Luang Phu Tuad which relate his incredible deeds and supernatural feats, which have made him perhaps the most famous Guru Monk in all Thai Buddhist History.